Prof. Katzenstein's education spans business, law, psychology, and economics. She obtained her academic degrees in the United States - an MALD in Law and Diplomacy from Tufts University, Boston and a Visiting Doctoral Scholarship at the Harvard Graduate School of Business Administration-, and in Switzerland - a Ph.D. in International Economics from the Graduate Institute of International Studies at the University of Geneva. Since then she has managed effectively to divide her time and energy between the worlds of business and academe. For the last two decades, Prof. Katzenstein's main business activities have focused on investments services to and active involvement as an active board member in Israeli high tech start ups. This was achieved through her work as owner and managing director of Forum International, an Israeli business development consultancy, and as a partner in Consulta Associates, an international business development consultancy, with an active network of affiliates in North America, Europe and the Far East. Prof. Katzenstein's academic resume is no less impressive. As one of the pioneers of Entrepreneurial Education in Israel, she has published many articles and lectured on this and related subjects at most of Israel's prestigious universities and management institutions as well as at major public organizations and private technology based corporations. Her experience as Associate Dean of TISOM (Tel-Aviv International School of Management), a private international business school in Tel-Aviv, led directly to her initiative in bringing Swinburne University of Technology's renowned Enterpreneurship and Innovation program to Israel in the framework of ISEMI, where she has served as Founder & President since 1996. 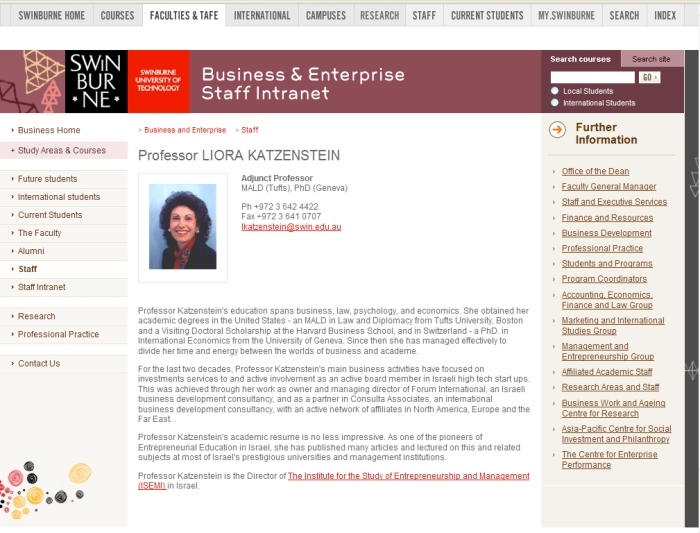 In addition, Prof. Katzenstein is a member of the Board of Directors of numerous companies, including Clal Industries & Investments (Israel's largest holding company), Discount Issuers Ltd. (Israel's third largest bank), Bezeq Globe (a subsidiary of Israel's largest telecommunications company), Amanet (one of the largest consulting companies), RadWare and RadVision (NASDAQ traded high tech firms) and several others. Amir Freund is a successful serial high tech entrepreneur. Previously he has been involved in establishing and managing NASDAQ - traded Floware Inc, which has merged with NASDQ - traded Breezcom, to become Alvarion Inc, Israel's largest telecommunications company. Following that success, Amir has been active in several aditional high tech startups, till he established in 2008 the incubator UnVC, where he supports technology start-up projects in a unique way that combines funding and mentorship. Dr. Epstein serves as ISEMI's Academic Director since 2000. In this capacity, he has been coordinating study programs, as well as the handling of students and lecturers. In addition, Michael has been activly involved in initiating innovative programs in the area of Social Networks and their influence on business. Leanida Belandzed is a professional in the area of management, specializing in hospitality and tourism with considerable experience in conference management. Following her experience in the former Soviet Union and in Europe, She is now a project manager at ISEMI, dealing with the organization, administration and management of several international projects, where her previous experience, administrative skills as well as the command of several languages is a great asset. Yonatan Lavsky has been involved in various administrative tasks at ISEMI since 2010. Currently a student of computer programming and business administration, Yonatan has been involved in presentation preparation, various IT tasks as well as participation in numerous lectures and other events, in Israel and abroad.